2012 Harley-Davidson XR1200X. Picture credits - Harley-Davidson. Submit more pictures. The agile XR1200X motorcycle is draped in a satin black finish for a menacing look. From the black powder-coated engine and straight-shot, high-performance exhaust to the upside-down forks, and the black cast aluminum wheels with orange rim highlight that jet the bike into a whole new era of race-inspired motorcycles�the XR1200X embraces the dark side while paying homage to the old school flat tracker that inspired its style and ease of handling. Price as new (MSRP): US$ 11799. Euro 11990. UK � 9599. Prices depend on country, taxes, accessories, etc. Ask questions Join the 12 Harley-Davidson XR1200X discussion group or the general Harley-Davidson discussion group. Click here to sell a used 2012 Harley-Davidson XR1200X or advertise any other MC for sale. 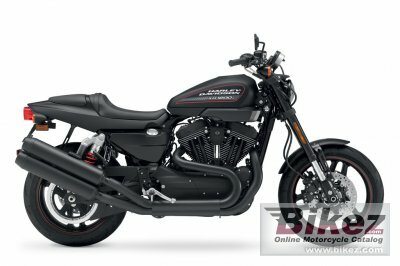 You can list all available Harley-Davidson XR1200X bikes and also sign up for e-mail notification when such motorcycles are advertised in the future. Ads with or without pictures are easy to create. Our classifieds are completely free with sections for every country in the world. You can also check out our list of related motorbikes. Compare technical data. Look at photos. View your fellow riders' rating of the bike's reliability, design, engine performance, accident risk, repair cost, etc.